As I zipped over to the #BettFutures stand trying to politely dodge the sales pitches and get there on time, I could see as I grew closer that a big crowd had formed there already. Over the years I’ve become progressively more confident to talking in front of others. Those of you who’ve known me for a long time or read my blog regularly know that I used to find it difficult to talk in front of peers – children in the classroom no problem, but adults – it was really a problem for me. It was really humbling for me to see all of you who came on Friday to hear me. Thank you so much for coming. I truly hope you found the ideas useful. I’m so in awe that so many of you came. Thank you so much. It was a lovely reception from a great crowd of educators. I was delighted too to see many familiar faces in the audience too such as @basnettj @HPSMissJessey @CEDavies84 @CPD4T and especially an old PGCE trainee I worked with @MrTRobins. I was then asked a number of questions from the audience. Unfortunately I can’t remember them all but I do remember my response to one of the questions about how to engage reluctant teachers with technology. I referred to the four stage chart of confidence and competence expertly updated by @sylviaduckworth. 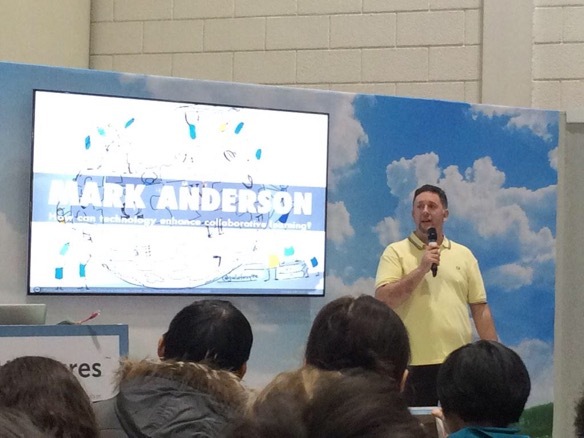 Massive thanks to @Ty_Goddard and @IanFordham for inviting me to speak on the #BettFutures stand, I simply loved being able to share some ideas from the classroom. If you have any further questions following coming to the session, please feel free to drop me a line or get in touch via the comments.